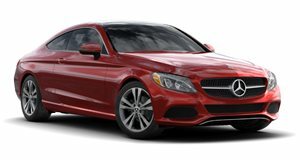 The Mercedes-Benz C 300 Coupe is available with a 241hp, 273 lb-ft turbocharged inline-four, a 9-speed automatic transmission is standard and power is sent to either the rear wheels or all four in the 4MATIC variant. Power, handling and economy are all up with the best in class although ride quality is poor as is rear passenger space. A panoramic sunroof and rearview camera are offered as standard while available options include cornering headlamps, air suspension and heated and ventilated front seats. 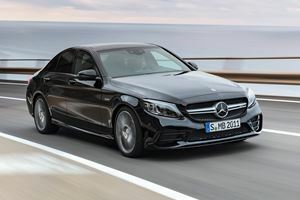 The Mercedes-Benz C-Class has been around in sedan form for a few years now and the recently revised coupe models really make the most of the already desirable exterior design. The deletion of two doors add a level of exclusivity to the range and as the C-Class coupe is offered with a similarly comprehensive level of drivetrain and trim options as its sedan counterpart, it is well-placed to challenge competitors like the BMW 4-Series and Lexus RC. For 2018 an improved base level of specification and a new transmission further enhance its desirability. The coupe offers a very similar interior to the sedan variants, this means high quality switchgear and cabin materials that would not look out of place in something a few categories higher. The long front doors mean that sliding into the front seats is even easier than in the sedan, the center console has the familiar infotainment screen and control unit that falls easily to hand. That svelte roofline and two-door layout mean that the rear row suffers a bit when it comes to head room and a degree of bending and contorting is required to climb into the back too. Shorter adults should find the rear seats supportive although it is best reserved for children on longer trips or used as extra cargo space. The cargo area is deep but not quite as generous as in the sedan, overall though, these are compromises that shoppers used to coupes will not be unfamiliar with. The C-Class coupe’s sporty suspension setup keeps it stuck to the road when things get twisty and it carves up corners in a very satisfying manner. This handling ability comes at the cost of basic ride comfort as the standard suspension struggles to soak up road imperfections, the available air suspension may improve matters as will sticking to the standard 18-inch wheels. Cabin noise is very subdued and even when pressing on the sounds coming from the engine bay are very muted, the controls feel responsive and accurate to driver inputs too, making the C-Class Coupe feel very sporty when the mood takes you. The 2017 Mercedes-Benz C 300 coupe is available with a 2.0-liter 241 horsepower turbocharged inline-four, its 273 lb-ft of torque is sent to the rear wheels or in the case of the 4Matic, all four. Both are offered with a 9-speed automatic transmission which is new for the coupe and the claimed 0-60 mph time of 5.9-seconds is right in the middle of the segment. The claimed 22/30 city/highway mpg rating is also competitive. There are more powerful AMG models in the range but for most purposes, the C300 is a capable and eager performer. Both the C 300 and C 300 4 Matic offer identical specification levels. They come well-specced as standard offering 18-inch wheels, rearview camera, panoramic sunroof, power front seats, 7-inch infotainment system with Bluetooth and smartphone connectivity options. A number of AMG trim options are available which offer unique exterior and interior details and the base specifications can also be bolstered with various packages. A Premium package includes blind spot assist, keyless go, electronic trunk closer and power-folding side mirrors. The Premium Driver Assist Package includes active lane keeping assist, active blind spot assist, pre-safe , speed limit assist and a Burmester audio system. 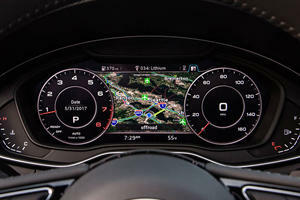 The Multimedia Package meanwhile adds a touchpad controller, 8.4-inch Comand hard-drive navigation with updates for 3 years and SiriusXM traffic and weather service for 5 years. The range of color and internal trim and insert options is vast and allows for a high level of individual customization. The 2017 C-Class Coupe possesses a level of style and build quality that its competitors find hard to compete with. Its dynamic abilities and strong performance further add to its desirability as do the comprehensive safety systems. 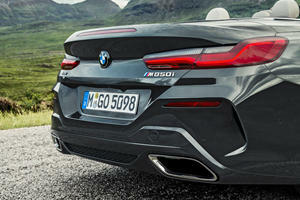 Cramped rear seating and limited cargo space are small prices to pay for such an accomplished midsize luxury sports coupe. With the rise of EVs, Japan Display believes drivers will care more about the interior than what’s under the hood.